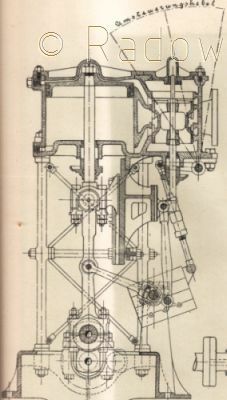 This section view I found during my research on the German steam boat machine in a book. It illustrates the standard steam pinnace engine of the German Imperial Navy from around 1900. These machines were built in two sizes with 20 and 30 hp - measured at 350 rpm. They propelled the pinnases of classes III, II and I with 8, 9 and 10 m in length. Although I have searched in the past two years various archives, I could find only this section view plus two side views, no further detailed drawings of these machines. At 1900, these were ordinary auxiliary engines, which apparently aroused no further interest to the documentation. After the introduction of internal combustion engines on the pinnaces, these machines are likely to be moved quickly into the scrap metal. Particularly since many of it`s parts were constructed in bronze in accordance with the Admiralty. I am still looking for photos and drawings of these and other German steam boat engines as models for other replicas. So I would be happy to get any information from you!